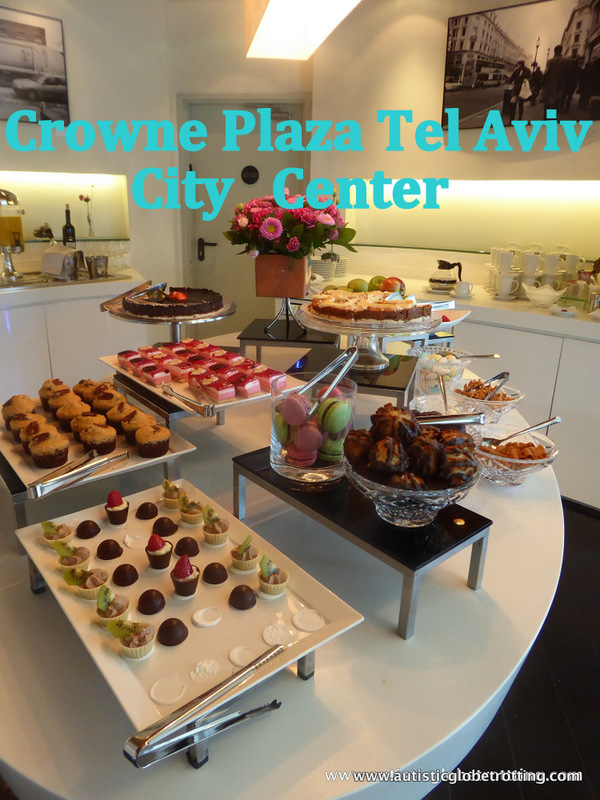 The Crowne Plaza Tel Aviv City Center is a sound choice for families looking for a budget hotel in the Israel’s coastal city. The property offers its guests top notch facilities and service as well as proximity to the city’s landmarks, shopping centers and public transportation hubs. 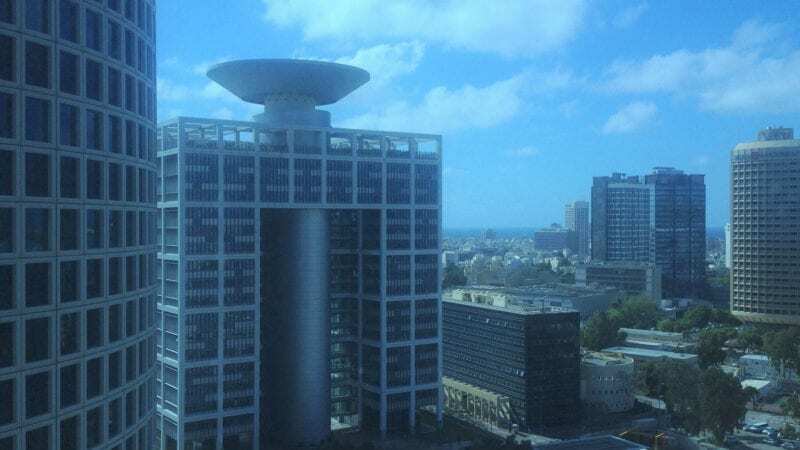 The Crowne Plaza City Center Tel Aviv is a five-star hotel is found at136 Menachem Begin Road in Tel Aviv, Israel, featuring 273 rooms and suites. 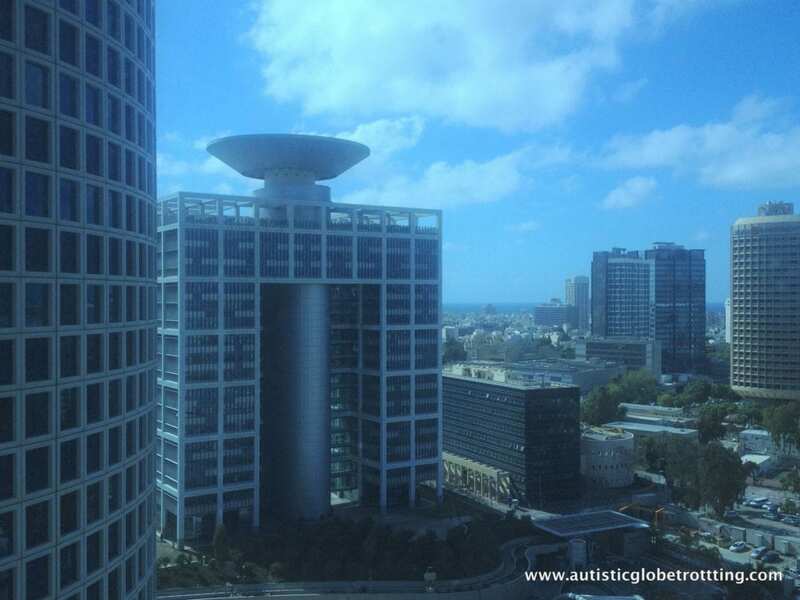 It is a part of the Crowne Plaza hotel chain.The building is part of the Azrieli mall and is also near the HaShalom train station. The city airport is likewise only a short 20 minutes drive away.The Crowne Plaza is typically frequented by business and solo guests, but couples on vacations and families are well accommodated and will feel very welcome here. This hotel was decorated in a comfortable modern style. White, black, and gray shades pervaded the building, but there were also occasional splashes of bright color in strategic spots which helped to liven up the décor. Proximity to a Mall and mini theme park. We enjoyed the fact that our room had a do not disturb button which could be easily switched on and off rather than the paper tags provided by many other hotels. Our suite also had a large closet with an ample cabinet and spacious area to hang up our clothes. An ironing board and personal safe could be found within. I particularly liked the safe’s design because it was created with a plug on the inside so that electronic devices could be recharged while still being securely locked away. The first thing one saw when walking into the room was a small coffee prep area complete with the appropriate supplies. In our suite, this spot was highlight with a lime green wall that made it particularly noticeable. Underneath the counter, there was a well-stocked minibar with cold drinks and snacks available for purchase. Our room additionally contained a large flat screen television that sat on a long black table and faced the bed. This allowed us to watch easily movies while lounging around. There was also a padded lounge chair located at the foot of the bed where I preferred to sit and enjoy my favorite television programs. Our suite had a comfortable king sized bed with plenty of pillows. Two nightstands and individual reading lights could be found on either side of the bed. One of the room’s two phones sat atop the nightstand that was furthest from the door and each nightstand contained numerous electric sockets which we put to good use. A full sized mirror and a highly visible temperature control device were also included in our room. 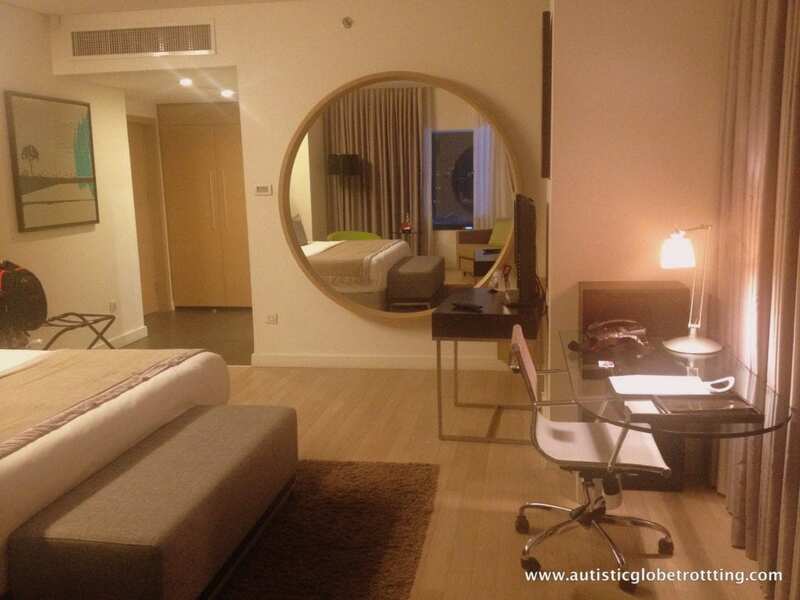 Although it was winter when we stayed, the day was warm, and it was a relief to be able to get air conditioning in the suite.I also liked the wooden flooring found in our hotel room because it is much better than carpet for allergy sufferers. I also appreciated the fact that the room was very well lit, and we had great city views out of the suite window. Our bathroom had bright orange walls with black and white accents. The bathroom had multiple level shelves above the sink area, and one contained a small amenity kit with various bath products. A large mirror ran along one wall. There was even a television in the bathroom itself. There was also a small, somewhat partitioned section that contained a toilet. The shower had non-slippery, raised flooring with a drain in the center. As far as I could tell, these features adequately served their purpose of keeping water from getting all over the place. The shower also had great water pressure. Although we didn’t use the separate tub found in the suite, it was well equipped with some grab bars to accommodate disabled users. 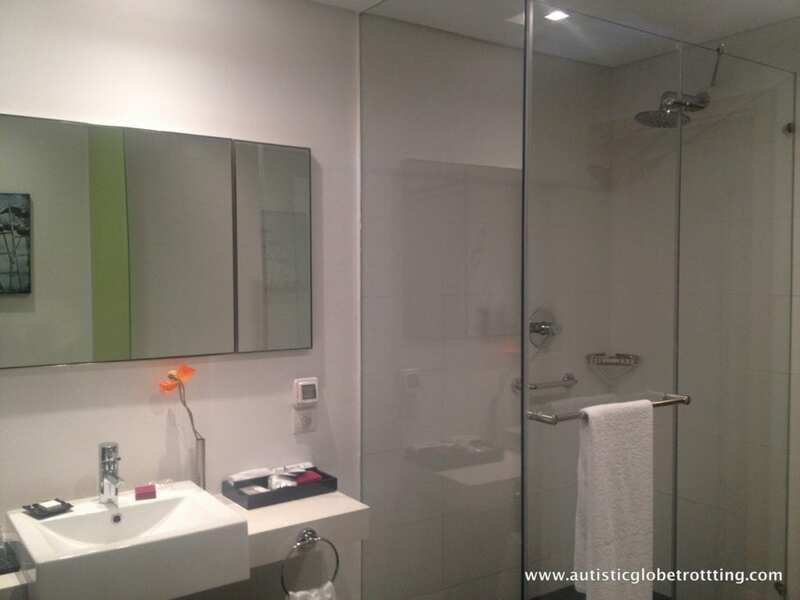 While the transparent glass in the shower could be annoying if one is traveling with family, the bathroom door itself was fully frosted so it can’t be seen from the bedroom area. The reception desk is open at all hours of the day and night so that guests receive the attention they need whenever a problem might arise. Babysitting, dry cleaning, and concierge services are also provided by this establishment. An airport shuttle and nearby parking can likewise be arranged for a small additional fee. Those that don’t want to venture into the city without funds will be happy to learn there is an ATM in the hotel. 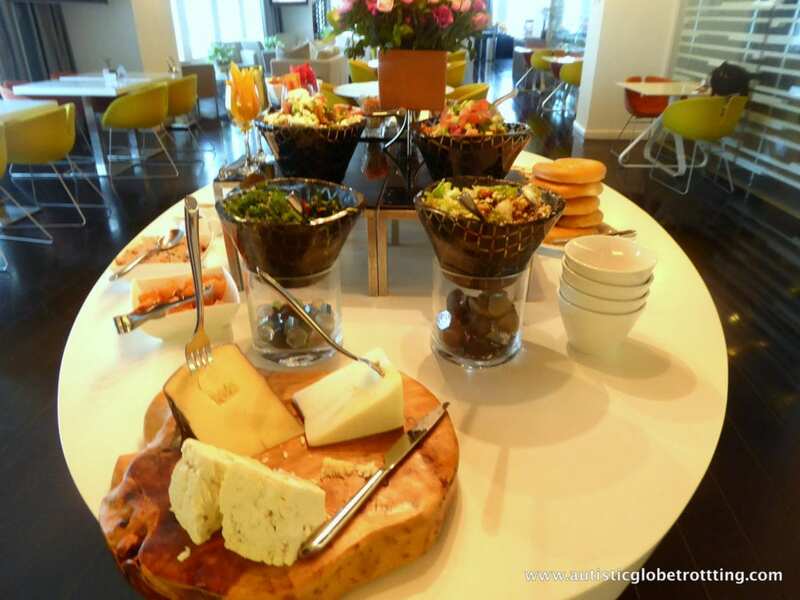 The onsite restaurant is a godsend for tired but hungry travelers. The eatery serves up tasty kosher cuisine and is open for all meals. Crowne Plaza City Center guests can enjoy a complimentary pass to the Holmes Place gym and pool in the Mall. 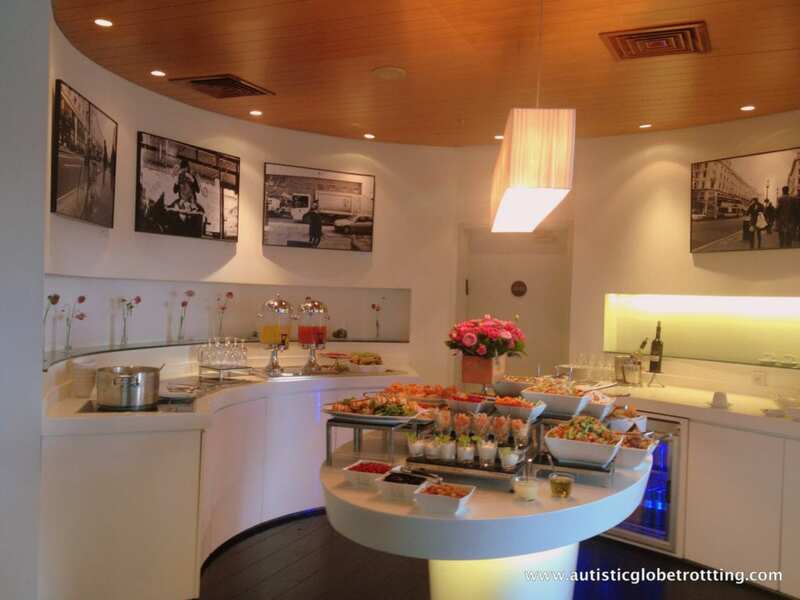 The property has a noteworthy executive lounge that overlooks the city on the twentieth floor that is open 24 hours a day and serves breakfast and dinner as well as desserts and snacks throughout the day. Families who wish to keep their kids entertained can visit the Sarona food mart across the street that has open areas and a fabulous kids gym with shaded facilities for children. For those wishing to go to the beach, the hotel offers a shuttle that runs on the hour to its sister property by the beach, The Crowne Plaza Beach Hotel on Hayarkon street.